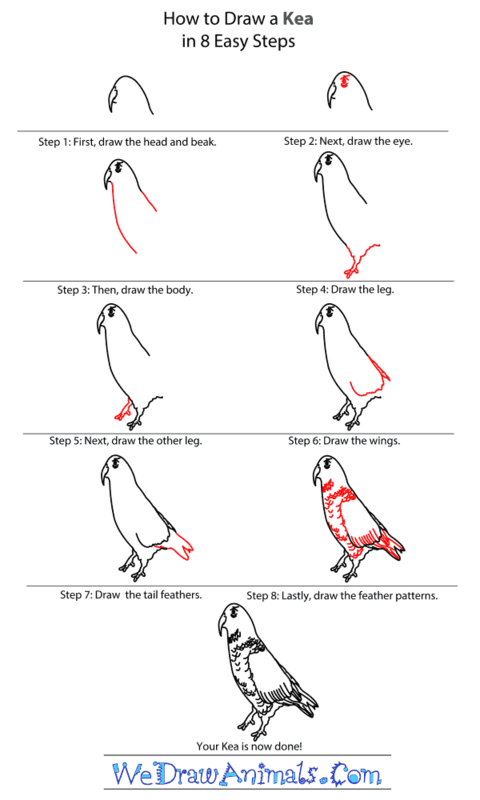 In this quick tutorial you'll learn how to draw a Kea in 8 easy steps - great for kids and novice artists. At the bottom you can read some interesting facts about the Kea. 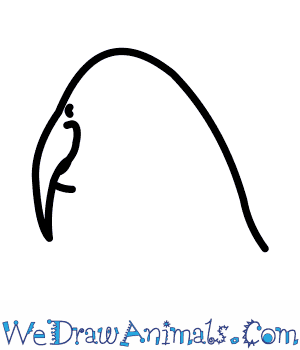 Step 1: Draw the head by making a curve shape, and add the pointy beak on the left side of the curve. 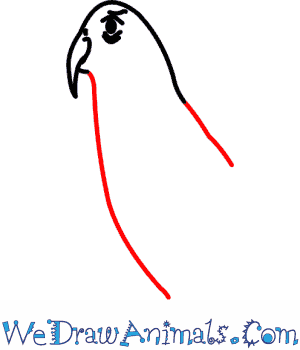 Notice the beak is a bit longer on the top, this is because the Kea eats a lot of fruit and nuts and have to be able to break the shells. Step 2: Draw an open almond shape with a circle inside for the eye. Color the smaller circle black, and add a few other curved lines on top and below the eye for detail. Step 3: For the body, draw two curved lines downward from the end of the head. The line in the back is a bit shorter. Step 4: Add the leg at the bottom as shown in the picture. The Kea has toes that are round at the end and not pointy. Make sure to leave an open space in the back. Step 5: Next, add the second leg behind the first. 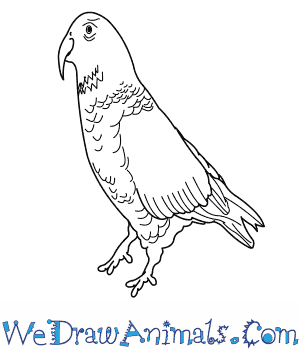 Step 6: To draw the wings, use small circular lines that form the shape of a 'U' at the bottom. 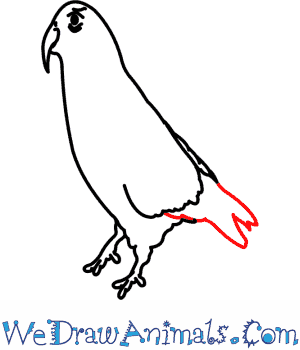 Step 7: Now, add the tail feathers using a few curved lines. 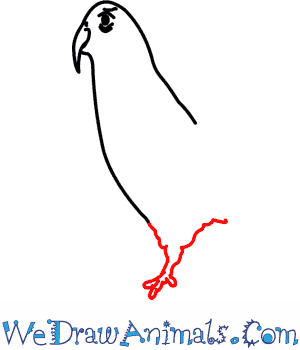 Step 8: To add the feather patterns, draw small curved lines throughout the body. 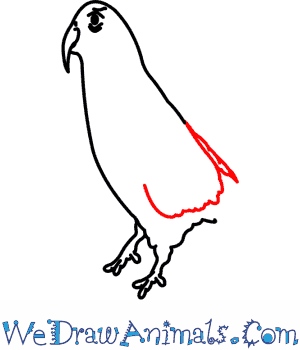 Then, add straight lines in the wings. 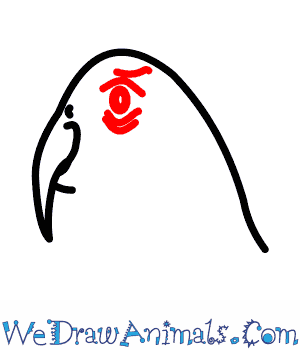 Use dark green to color the body of the Kea, and black for the beak. Keas are parrots that live only in South New Zealand. They can be found in forests and migrate to higher altitudes during the winter. Keas eat a lot of different food like: roots, fruit, leaves, nectar, insects, and surprisingly animal carcasses. They are known to be very intelligent and playful. 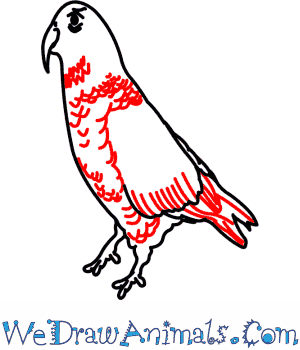 Scientists have studied the birds and found a complex and structured family structure. Male Keas are leaders of groups of up to 13 females and chicks. Keas are olive green with red tails and orange underwing feathers. They nest in burrows and under tree roots. They are 19 inches long and weigh 1-2 lbs. The Kea species is considered vulnerable to extinction. Locals refer to the birds as “the clowns of the mountains” because they torment tourists and hikers. Keas are known for exploring backpacks, cars, and stealing small items. Males will feed a female while she sits on their eggs. The oldest living Kea was 50 years old in captivity. For years ranchers believed Keas where attacking their sheep for food. They hunted them to protect their flocks, but in 1986 the government gave the birds full protection. In 1993 rare video evidence was found proving that Keas do attack sheep in their sleep. Fun Theme: Since a group of Keas are called a “Circus” why not make the classroom circus themed? This theme could also be an excuse to discuss other animals that are more commonly found in zoos.